While the government has been busy making loud claims of savings and delivery of benefits due to Aadhaar, the Rajya Sabha was told that there was no study conducted to evaluate benefits of Aadhaar linking to Mahatma Gandhi National Rural Employment Guarantee Act, 2005 (MGNREGA) scheme and its beneficiaries. 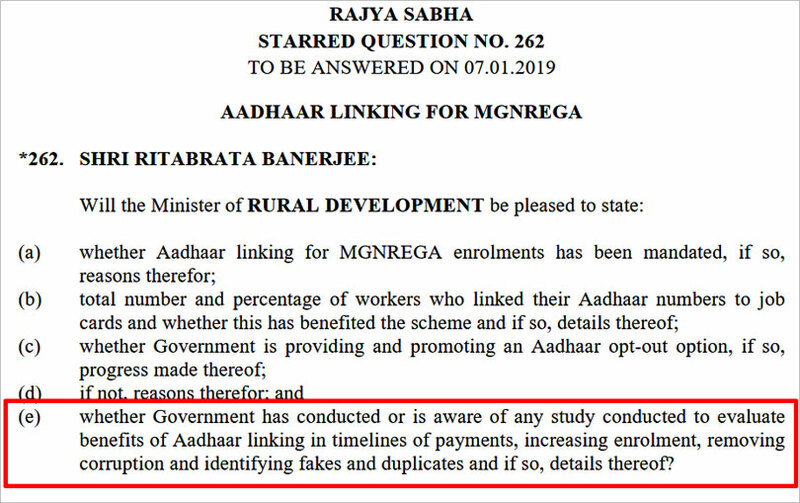 Rajya Sabha member Ritabrata Banerjee had asked the question to know if there was any study conducted to evaluate benefits of Aadhaar linking in timelines of payments, increasing enrolment, removing corruption and identifying fakes and duplicates in the MGNREGA scheme. In his written reply, Narendra Singh Tomar, minister of rural development, said, "No such study to evaluate benefits of Aadhaar linking in respect of MGNREGA, has been got conducted by the Ministry." According to the minister, out of pl convert to millions MGNREGA workers, the Aadhaar number pl convert to millions (89%) active workers have been seeded into MGNREGA programme database (NREGASoft). "Use of Aadhaar under MGNREGA has brought transparency in the system and minimised leakages of fund," he claimed. Replying to a question on whether the government is providing and promoting an Aadhaar opt-out option, Mr Tomar stated that the Unique Identification Authority of India (UIDAI) has not created any general option to exit from Aadhaar. He claimed "...such an exit option has only been mandated for children who have been enrolled with consent of their parents provided that they do not intend to avail the benefits of the scheme. No general option to exit for Aadhaar was laid down by the Supreme Court as a binding direction and consequently no such option has been created." "Those persons who need to avail any subsidy, benefit or service would need Aadhaar in any case...On the other hand, those who do not get any benefit of the nature prescribed under Section 7 of the Act, it would always be open for them not to make use of Aadhaar card or to make use of this card in a limited sense, namely, showing it as a proof of their identity, without undergoing any authentication process," the apex court had said. Earlier in 2014, responding to queries filed under the Right to Information (RTI) Act, the UIDAI had admitted that there is no way to delete biometric data if a person wants to ‘opt’ out of Aadhaar—there is no exit. Even during the marathon hearing before the five-judge constitutional bench of the Supreme Court, attorney general (AG) KK Venugopal too admitted that there were no field level studies for audit of exception registers or verification of enrolment rejections. The AG had also accepted that there was no opt-out in Aadhaar even for children who are enrolled after they attain age of consent. This was overruled by the apex court and allowed children to opt-out of Aadhaar after attaining age of consent. Earlier in July 2018, in a written answer, Ram Kripal Yadav, minister of state for rural development, had said "As per management information system (MIS), states and union territories have deleted 1.94 crore beneficiaries registered under the MGNREGS during FY2017-18. The reasons are fake identity, duplicate job cards, wrong allocation, deceased, and person shifted to new family." Everyday there are news reports and information coming out in public domain about leakage of Aadhaar data. However, every time the Unique Identification Authority of India (UIDAI), the agency that issues Aadhaar, provides a standard reply that tries to say 'all is well' at their end. Unfortunately, UIDAI does not even have a chief information security officer (CISO), reveals a reply received under the Right to Information (RTI) Act. Internet researcher and alumnus of IIT Madras, Srinivas Kodali had asked for names and tenure of CISO in UIDAI since 2009. Replying to the query, Virender Prasad, additional director general and chief public information officer (CPIO) of UIDAI, stated, "UIDAI has not employed any CISO. Therefore, the information (sought) may be treated as 'Nil'." Just few days ago, technology news portal, Techcrunch.com exposed how the security lapses involving India's Aadhaar continues. TechCrunch asked Baptiste Robert, a French security researcher who goes by the online handle Elliot Alderson, to take a look at the Jharkhand government's website. "Robert has prior experience in revealing Aadhaar-related data leaks. Using less than a hundred lines of Python code, Robert demonstrated that it was easy for anyone to scrape the entire site in batches to download their photos and corresponding Aadhaar numbers," the report says. TechCrunch says it verified a small selection of Aadhaar numbers from the site using UIDAI’s own verification tool on its website using a virtual private network (VPN) in Bengaluru as the page was unavailable in the US. Each record came back as a positive match, it added. It says, "The exposure may represent a fraction of the billion-plus users registered with Aadhaar, but uncovers yet another inadvertent disclosure of citizen data from a system that UIDAI claims is impenetrable. Instead of learning from mistakes and mishaps, UIDAI instead has shown a long history of rebuffing evidence of security incidents or breaches with mockery and declaring findings as 'fake news,' by claiming to refute evidence without presenting any of its own." However, according to Techcrunch, the exposure alone contradicts the Indian government’s claims that the Aadhaar system as a whole is secure. "In recent years, several security lapses involving data relating to Aadhaar have reignited fresh concerns about the centralised database—including several issues found by Robert. Last year, security researcher Karan Saini, a New Delhi-based security researcher, found a poorly secured web address used by state-owned utility company Indane that had direct access to the Aadhaar database, allowing him to query results from the system. UIDAI rubbished the reports, baselessly claiming that there was 'no truth to this story' in a series of tweets from its official Twitter account, despite evidence to the contrary. In the same year, India’s Tribune newspaper reported that some were selling direct access to the Aadhaar database. UIDAI responded by filing a complaint against the reporter with police," Techcrunch says. The five-judge constitution bench of the Supreme Court, in September last year, had restricted the mandatory use of Aadhaar to welfare programmes for which the money has been provided from the Consolidated Fund of India. The apex court also struck down Section 57 of the Aadhaar Act that had allowed banks, telcos and other private entities to use Aadhaar. However, notwithstanding the Supreme Court judgement, the government is trying to make sure that private entities continue to use Aadhaar. In addition, Ravi Shankar Prasad, the law minister, has said that the government will bring a Bill to make it mandatory to link driving licences with Aadhaar. But more about it later. Last week, the Narendra Modi-led government passed the Aadhaar and Other Laws (Amendment) Bill in the Lok Sabha with very little debate or scrutiny. The Bill is now in the Rajya Sabha. On an earlier occasion, when the upper house has rejected Aadhaar Act, the government got it passed as money bill by bypassing the Rajya Sabha. Legal scholar, Dr Usha Ramanathan, says, "The Aadhaar Act was passed as a Money Bill. The Court was able to uphold the Act only after they struck down Section 57, which allows business interests to use the Aadhaar system. This new amendment attempts to get past that by a convoluted method—offline verification as may be specified by regulations, leaving it to the Unique Identification Authority of India (UIDAI) to experiment on us, and includes things like virtual ID, and other forms using the number." Rethink Aadhaar campaign says it is alarmed by the government misleading Parliament on the Aadhaar Amendments Bill, and on the purported savings resulting from linking Aadhaar to various welfare schemes. "Mr Prasad claimed the amendments proposed in the Bill are 'in compliance with the SC order'. This is not true, and the SC has nowhere directed the government to frame laws for linking Aadhaar to mobile or banking services. Right from the day of the SC judgment the government has manipulated the Court's directions with an aim to expand Aadhaar applications, with Finance Minister Arun Jaitley on the day after the judgement hinting that the government may bring a new law to allow continued use of Aadhaar by private companies," it added. According to Dr Ramanathan, the amendments allow not only offline verification, but also authentication, supposedly with the consent of the individual. She says, "After the judgement of the apex court, the use of the Aadhaar system by private and business interests is prohibited. Using 'voluntary' and 'consent' as a cover does not make it right. In Para 367 of the majority judgment, the judges had only said, 'if such a person voluntary wants to offer Aadhaar card as a proof of his/her identity, there may not be a problem'. That does not allow the use of the Aadhaar system, not even voluntarily." The Supreme Court had allowed the use of Aadhaar for Section 7—which is for delivery of services, benefits and subsidies. On the issue of failures in linking and in authentication which has resulted in starvation deaths, the apex court merely said that the attorney general had stated that the government would take care of this. "Now, in this amendment, they say only this: provided that the requesting entity shall, in case of failure to authenticate due to illness, injury or infirmity owing to old age or otherwise or any technical or other reasons, provide such alternate and viable means of identification of the individual, as may be specified by regulations". This amendment, in other words, does nothing for the poor, only for business interest, which the court said could not be done using this project, Dr Ramanathan added. Over the years, the government has been trying to make big claims on savings due to Aadhaar which were found to be not true. In fact, both Mr Prasad and finance minister Arun Jaitley's claims of Rs90,000 crore saving due to Aadhaar, are based on a report from the World Bank, although the Bank itself had debunked the report. "The report from the World Bank talks about total extrapolated value of direct benefit transfers was misrepresented as savings. As Dr Reetika Khera pointed out, the World Bank only perpetuated claims that were subsequently disowned by the government. The latest claims are again false and an attempt to mislead Parliament," Rethink Aadhaar says in a statement. The Govt. estimates that Rs.90,000 crore have been saved by the use of Aadhaar till March, 2018. Several duplicate, fake, & non-existent beneficiaries have been eliminated. According to the @WorldBank Digital Dividend Report India can save Rs.77,000 crore /year by using Aadhaar . According to Dr Anupam Saraph, a renowned expert in governance of complex systems, who also advises governments and businesses across the world, neither the ministry of finance nor any government ministry or department has provided any indication of the steps in the flow of funds from the Consolidated Fund of India to the hands of the beneficiaries. "UIDAI and ministry of finance must certify that this money has been transferred to real and genuine beneficiaries. Neither the recipients’ database nor the money transfers have been audited or seem to have been verified by the CAG. Furthermore, no beneficiary database, or even the basis for inclusion or exclusion of beneficiaries from this database, is available with the public. The UIDAI has stated unambiguously that it takes no responsibility for the use of Aadhaar. It cannot recognise the use, or the absence of use, of Aadhaar in any business process. Neither can it certify the beginning, progress or completion of the business process," Dr Saraph, says in his article published by Sunday Guardian. In her article in the Economic Times, Dr Khera and Jean Dreze say the numbers touted as saving due to Aadhaar by the government have no solid basis. "...the savings estimates do not pertain to Aadhaar as such but to the use of digital technology in subsidy transfers. Indeed, the smart cards study invoked in the said footnote does not involve Aadhaar at all. Even in the direct benefit transfer for liquefied petroleum gas (DBT-L) experiment, Aadhaar is only one component of the project, and a direct bank transfer can itself increase enforcement, irrespective of unique ID. The $11 billion figure (quoted in the World Bank report) is routinely construed as an estimate of ‘Aadhaar-enabled savings’," the article says. Earlier in August 2016, a report from the Comptroller and Auditor General of India (CAG), said, 92% of the Rs23,316.21 crore the government saved in subsidy payout in FY15-16 occurred due to a drop in crude oil prices and both the government and oil marketing companies had overstated savings under the scheme. The actual subsidy payout during April-December 2015 was Rs12,084.24 crore against Rs35,400.46 crore during the same period in 2014. Delivering his address at the 106th Indian Science Congress, Mr Prasad, the minister for law, electronics and information technology, has said the government will soon make it mandatory for linking Aadhaar with driving licences. "At present, what happens is that the guilty person who causes an accident flees the scene and gets a duplicate licence. This helps him go scot-free. However, with the Aadhaar linkage you can change your name but you cannot change your biometrics, neither iris nor fingerprints. So the moment you go in for a duplicate licence, the system will say this person already has a driving licence and should not be given a new one," the minister was quoted as saying in a report. In that case, nobody seems to ask how the linking of Aadhaar with driving licence will help reduce number of accidents. Or whether the government want to reduce number of accidents or bulldoze Aadhaar into driving licence system. While Aadhaar is unverified, unaudited and unauthenticated number, an official from the regional transport office (RTO), by signing on the driving licence, is liable for the information. No official from any government authority or even UIDAI neither signs on Aadhaar nor is liable for genuineness of the information and data recorded in their database. Rethink Aadhaar, along with eminent civil society members, petitioners in the Aadhaar matters that were the subject of the 26 September 2018 judgement, as well as other citizens of India, demands that members of Parliament (MPs) in the Rajya Sabha should immediately send the Bill for a legislative review by a Select Committee of Rajya Sabha, and public consultation. I am among those who are not enamored by the contents or timing of the adhaar judgement of the apex court. Questions about adhaar and its validity had been raised since the beginning when the idea itself was mooted. It was after a couple of years after enrollments began that even a law was enacted to give it legality. And being offered free there were no dearth of enrollment then too. Cases had been filed in the apex court, questioning the adhaar, even before the NDA government took over and went into a mission mode to use it even for reservations in railways. The court sat on them all the while when it had convened a sitting at midnight to over rule the discretion of the Governor of Karnataka in deciding to seek a vote of confidence in the Legislative Assembly. And then finally it wakes up and gives a half baked judgment which has not taken cognizance of any the issues listed here. I had been an opponent of the system based on reports that developed countries like the US of A, UK and Australia had tried to introduce similar systems but given up due to privacy and cost issues. And in India, in 70 years we have not even been able to streamline the issue of ration cards. Yes, in the last fortnight only it was reported that the Chairperson of the Kerala State Women's Commission, Ms Josephine, had two cards- one BPL card along with her husband and another ordinary with her brother's family at a different location! And what did the government do? Just cancel those cards! Those who have transferred their ration cards from one place to another would recognize the rigmarole they had to go through and who all will have to be prosecuted for the lapses or connivance. I wouldn't be wrong in plagiarizing Constantin Demiris in Sydney Sheldon's The Other Side of Midnight and say that a thousand times more crimes have been committed in the name of justice by our judges than by all the criminals they have convicted so far. I have been thinking about opening an online account with Zerodha for a while. Today, while checking out the details for their requirements (relevant page URL: https://support.zerodha.com/category/account-opening/online-account-opening/articles/what-documents-do-i-need-to-open-an-account ), I find that Aadhar appears to be a requirement for opening an account with them! How is it that they still continue to ask for Aadhar details! Why this "kola veri" about a unique identification system which has more benefits than deficiencies? Those who are opposed to adhaar are those who hate transparency. I have not come across a single case where adhaar has resulted in any loss or difficulty to any one. The Mumbai person who lose money did so because of he did not use safeguards available in all banking activities; it was not because of adhaar fault. You people are writing so much about Aadhaar Ban by supreme court, I appreciate your work. But my exp is where ever I go be it Post office to open an NSC they just say till now we have not got any orders from govt to stop taking Aadhaar and till then you are suppose to furnish else we will not open an NSC. Go to any govt dept they just ask abt Aadhaar else our work will not be done at all and we land up giving it to get our work done in the eleventh hour. The order from the Supreme Court is very clear on where Aadhaar can be used and where it cannot be. And since the judgement by the apex court is law of the land, the govt offices, post office or anyone else who is not authorised to use Aadhaar, simply cannot ask for it or make it mandatory for anything. Here is the link to the SC order https://www.supremecourtofindia.nic.in/supremecourt/2012/35071/35071_2012_Judgement_26-Sep-2018.pdf Check majority judgement at around page no576 and show it to the concerned govt officials with a warning that what they are doing is contempt of the Supreme Court. I am a NRI where I am living, government issued Adhar like identity Number which is required from accounts opening, telephone connection, hiring a house, almost for all activities. If my understanding is correct in US also the same. We are all aware when we started to use credit card or application of visa for foreign countries we need to provide our full family history. Why are we opossing to provide basic details (Adhar) ? Am I missing some thing to understand. Please educate me. I am very much interested to learn and understand opposite view. All my above view is from my personal experience. I do not want to speak on behalf of any one. Please help me to understand. Thank you. Thanks for your comment. Major difference between SSN in the US and Aadhaar in India is collection of biometrics and use by any sundry entity. Plus, in other places, the ID doesn't determine the beneficiary, it helps only in identification, while human officials take the decision on benefits/services. Here Aadhaar is being mad into the decision maker depriving crores of senior citizens (biometric mismatch), destitute people the benefit/ service aimed at them. Do read this https://www.moneylife.in/public-interest/aadhaar for more info. I hope the Supreme Court catches on when the matter comes before it in the new Amendment Bill and these points are taken up in the review petition to be filed. 1. Why GOI is indulging in such foolish acts in violation to SC judgment? 2. Is it the handiwork of duds of adhocism in PMO/UFM? 3. SBI has been experiencing, when its customers are losing INR in crores. An NRI from Mumbai lost Rs.1.75 crores from his Savings Acount on getting 6 missed calls on his mobile. 4. Are there any brains in RSS/BJP cadres to arrest this foolish + hasty act? 5. Instead of going in for ‘false prestige’, Shri Narendra Modi, Shri Arun Jaitley + Shri Prasad must apply their minds & pass the bill in tune with SC Judgement. Any suggestions from you for protecting the several illegal uses of driving lessons? No point in your just criticising every Govt move. Every time you criticise, give an alternative suggestion then only it means you have applied your mind. Well said as for citizens who are watching the anti-corruption measures. So it is only the opposition parties who were/are being affected by Aadhaar linking. They only instigate global media to dig out its weakness. To support prevention of digging out of foreign money receipts or deposits abroad. Real politics. Manmohan Singh and Nandan Nilakeni were heckled at and intercepted aadhaar's release and promotion. Finance Ministry played big part in that game. The alternative solution is obvious. Aadhaar should not be there at all. That is what most of us petitioned the Supreme Court about.